Stadt Waldenbuch: Sandstone sculpture "Life"
Senioren > Freizeit > Art & Culture > Art in Public Places > Sandstone sculpture "Life"
Monumental in its dimensions and form, chunkily rooted in the earth, resting in its own coherence, differentiated and full of tension in the texture of its surfaces, yet clearly structured into different masses, this sculpture titled "Life" was created from Pliezhausen sandstone, hewn and honed by Willi Hahn, who formed it after his own, highly individual ideas. Seeking out the stone's natural structure, the shading of its layers, its character, the sculptor only seemingly allowed the predetermined forms to develop freely. On the contrary, he intervened where necessary, separating, consolidating masses, creating highs and lows, planes and curves, finely- or broadly-structured areas, coaxing the stone into its final, inimicable, meaningful form. Released from naturalistic concepts, it is a symbol and an archaic manifestation in one. Life is synonymous with growth, culmination, cohesion. It signifies tension, breathing, repose. The beautiful stone expresses all these and more. 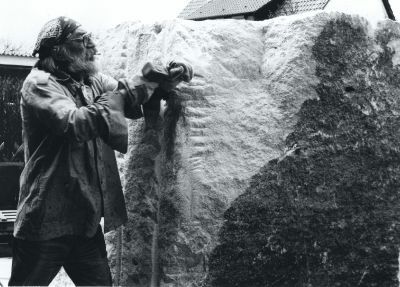 During the nine months that it took to complete – the sandstone block was delivered in April 1987 and the work of art completed at the end of 1987 – its volume diminished in the course of the artistic process with its characteristic "parings". The original block weighed 7.9 tonnes. Willi Hahn decided on a sculpture, a form of expression that requires caution and sensitivity. How easily it is to destroy everything with one false stroke! Today the stone measures 160 cm in height, 145 cm in breadth and 150 cm in depth. These are the average measurements. They diverge not only at the corners, by virtue of the overall irregular shape. The statue has no specific viewing side; the mighty form presents itself in a wealth of different aspects that merge to a whole when one walks round it. And only by circling the sculpture does it reveal itself, disclosing crevices, fissures, bringing to life the textures in the stone, clearly highlighting spurs of rock and overhangs, depending on the light. The organic and the fantastic blend. Association and corporeal form and landscape. An evocation of the Grand Canyon or the rocky deserts of Utah. On one side a broad, ruffled band traverses the stone to create a vertical accent. "Garter", is how the artist describes it. And that's just what it looks like. Treated like a relief in the upper part, with clear boundaries on both sides, and with the lower section more closely integrated into the surface through blurring and distortion, it acts as a leitmotif in the composition. Next to it, taking up the line, are a modifying distortion and a row of indentations and bulges. The upper portion of the stone also has a pleated appearance. The relief wraps itself around the stone like a protective embrace. Its rhythm defines both the monumental, austere side, which speaks to us as an expansive, serene composition, and also the face that is split down to the middle, threatening to break asunder. It appears finally as a polymorphic motif in the fissures and clefts. Like a gentle modulation it sheathes surfaces, blurring transitions, slurring edges. Variations on a leitmotif. Seeing the sculpture for the first time, one tends to think of erosion. Have wind and tide perhaps swept over it? Willi Hahn's inspired creation proves to be a statement of a sculptor pondering the lines of life, who does not subdue the stone, but rather makes it speak. Life to him does not mean a construed antitype, but is a tentative grasping of nature. And by creating a symbol of life, he draws on all of those motifs familiar to us from his paintings, graphics and statuary. Mankind, femininity, the primordial mother are the themes that he examines artistically in constantly new approaches. Reduced to the basic forms of human existence, his figures have something inherently archaic. Unconditionality and tragedy manifest themselves, as does their interconnection with nature. His sculpture "Life" represents a successful synthesis of man and landscape. Willi Hahn's sculpture was commissioned by the town of Waldenbuch. It stands on the school playground of the Oskar-Schwenk-Schule.